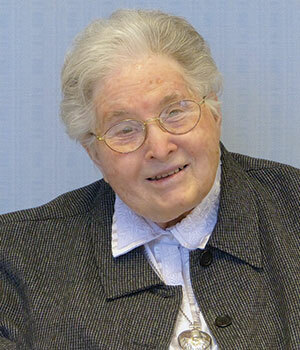 In honor and celebration of Sister Constance Mary, we share her story. Sister Constance Mary Ackerson was the daughter of Ludwig Ackerson and Anna Voeller Ackerson. Ludwig’s parents were natives of Stockholm, Sweden. Anna’s parents were of German and Russian heritage. They lived in Odessa (now part of Ukraine) on the Black Sea and had relatives in North Dakota. Ludwig and Anna each immigrated to the United States and settled in Saint Paul, Minnesota. They met and married in Saint Paul and subsequently moved to California. Sister Connie was born in Pasadena, California. The family later moved to Santa Barbara. Sister Connie’s brother Bob, remembers that Connie loved to go to the local Santa Barbara beach where she and her younger sister Lorraine often played. They jumped and rode the breaking waves screaming all the way! Connie graduated from Santa Barbara High School where she was a cheerleader which Bob sees as an early indication of her level of enthusiasm and sociability throughout the rest of her life. Lee Ann Moore, our activities director at Saint Mary’s Convent, attests to the enthusiastic involvement that Sister Connie brought to all the activities provided. 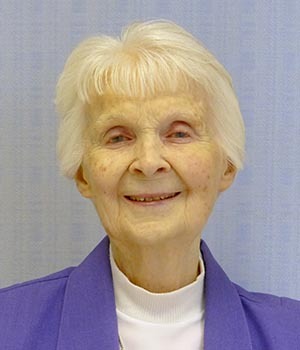 In her heyday, Sister Connie was the most active participant in activities at Saint Mary’s attending almost all of the wide variety of programs offered. After high school Connie graduated from Santa Barbara State Teacher College. She then worked as a dental assistant for 9 years before entering Holy Cross. The Ackerson family belonged to Our Lady of Sorrows parish and Connie had great devotion to the Sorrowful Mother. While working in Long Beach, California, Connie met Sister Catherine Agnes and Sister Margaret Flaherty, who were both at Saint Barnabas parish. After making a retreat and praying for guidance Connie made the decision to enter religious life and asked Sister Catherine Agnes to help her with the preparations. Sister’s religious name was Sister M. Anne Goretti a name she cherished as being her mother’s name. However, when the opportunity presented itself, she returned to her baptismal name, Constance Mary—the name her parents chose for her at birth. Sister Constance Mary always mentioned that she entered the Sisters of the Holy Cross in 1954 during the Marian Year dedicated to Mary. Sister cherished her name Mary. Her first name Constance also seems special and so appropriate for someone known for her firmness of purpose and constancy in life as a consecrated religious. 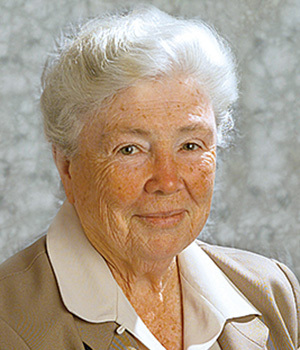 Sister Constance Mary’s 39 years in active ministry included elementary education in Catholic schools in Arizona, California, Idaho, Nevada and Utah. She returned to California where she was a pioneer of parish religious education at St. Matthew’s Parish, San Mateo, and Mission San Buenaventura in Ventura. 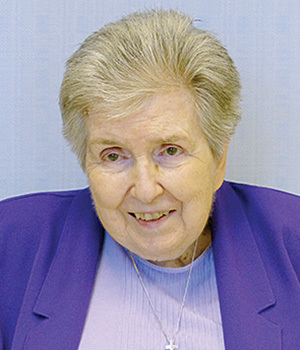 Sister Connie was a welcoming presence in the parishes where she served and continued to be so as part of the support staff at Holy Cross Medical Center, Mission Hills (now known as Providence-Holy Cross Hospital). 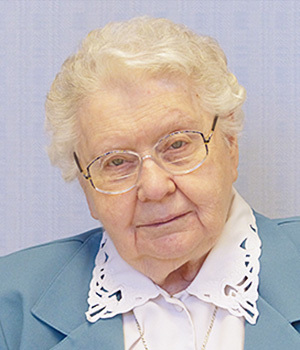 Sister Constance Mary’s niece Kathy Brady, sent a reflection on her relationship with her aunt over a lifetime. The excerpts included below share Sister Connie as experienced by Kathy and the rest of the family. “My name is Kathy Brady. Sister Constance was my aunt. She was the sister of my mom. They were only 14 months apart in age. My mom passed away 6 years ago. Aunt Connie also has a brother, Uncle Bob who is still alive and a few years younger than she. They came from a loving, close family. I have two brothers and we are all one year apart in age.… Aunt Connie was always a big part of our lives in many ways…. “She told me that she got the inspiration from God to become a nun and that she wanted to dedicate her life to Him. That she did. 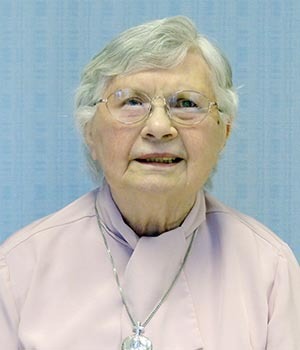 She was so happy being a sister and loved all aspects of her religious life.…In later years she ran the CCD programs for children’s religious education at various schools. She was a huge help for me, as I taught CCD myself for many years in different grades; she would not only advise me, but would send me information, articles and other things that would help with topics that I was teaching. “Aunt Connie was always a presence in our lives, even when she was not there in person. She celebrated every sacrament with us even if by mail or phone. I still have the rosary she gave me for my First Holy Communion. She was there for us as counsel through our teenage years as well. She helped form us and strengthen our love for God and for me personally, the Catholic religion. “My husband Rick and I have been married for 49 years. We have four children: Shannon, Stephen, Erin and Michael. I bring this up because she was a big part of their lives too.…She strengthened their faith as well. “She loved fun. She enjoyed going to the beach and swimming…playing games and walking. She was a joy to have around. “I am so happy that my husband, myself and my uncle and aunt could go to Aunt Connie’s golden jubilee.…She would always say that she was God’s spoiled child and she appreciated all her life had to offer. In the years to follow we could see her memory was fading, but her undying love was always there. In conclusion,I offer you the words of Craig Roberts, Sister Constance Mary’s nephew. They are a fitting farewell to valiant woman of faith. In Craig’s words of eulogy, he quotes from the Gospel of John, Chapter 14. This happens to be the same gospel passage that Father David Porterfield, CSC, had recommended for the funeral liturgy. 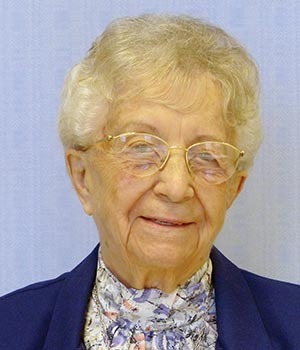 There seems to be a movement of grace and connectedness among all those praying for and thinking of Sister Connie even without communicating with one another. Craig wrote the following message. “Aunt Connie, we love you and will miss you very much. The good news is that this is not the end of life, but the beginning of everlasting life together in heaven with Jesus and those who have preceded us. Sister Constance Mary, I will never forget the impact you had on my life through your patient prayers when I came back from the Vietnam war and was searching for the peace of God in my life. 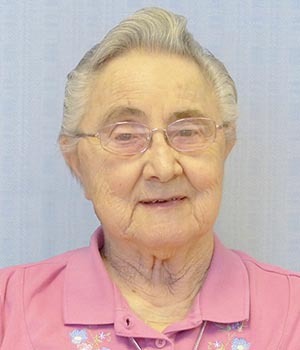 Sister Connie, in the years you lived in Little Flower Community at Saint Mary’s Convent, your loving smile warmed the hearts of all who cared for you. It was a little touch of God’s sweetness in our everyday lives. We will miss your gentle, grateful presence among us. 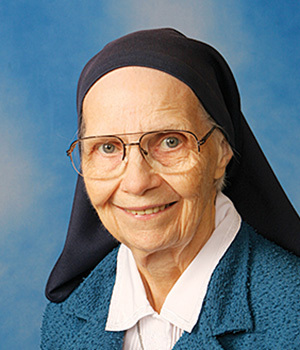 Sister Constance Mary, we rejoice that you are enjoying the God’s eternal light and love. Pray for us that we may follow your example of sharing the joy of the Lord with those we meet along the way.